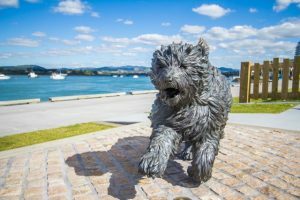 If your kids have ever been into Hairy Maclary books, it’s worth stopping at the sculptures on the waterfront which bring all the main characters of Lynley Dodd’s most famous books to life. The bronze sculptures can be climbed on and provide a good photo opportunity. Just nearby there’s also the Waterfront Playground (and Splash Pad operating in the summer months). The equipment has a maritime feel to it with a Lighthouse themed tower, housing 2 tunnel slides and a Pirate Ship construction of rope activities for climbing and swinging. Although fenced off, it’s worth noting that a railway line runs at the back of this playground and the sea is to the other side so young kids that are liable to run off, will need to be supervised closely. The whole waterfront area is a great places for walking/scooting along. Address: The Strand near the junction with Wharf Street. Both streets have limited car parking.